Pregnant women may be more sensitive to the flu virus during pregnancy due to changes in the immune system. According to the U.S. Department of Health and Human Services website, pregnant women should seek out the flu shot as soon as it becomes available. Flu shots are approved for use during pregnancy, but nasal solutions should be avoided. Flu shots contain dead viral flu strains, while nasal vaccinations are developed from weakened strains of the flu. Experts support flu vaccination during pregnancy to protect the pregnant women from getting sick with the flu, but protection is extended to baby as well. Flu vaccination during pregnancy helps protect your infant after birth. Breastfeeding continues protection; keeping baby healthy during flu season. Contracting the flu during pregnancy can be a health risk for baby in addition to mom. Infants of mothers who have suffered the flu during pregnancy are at higher risk of premature labor and early delivery. Birth defects are also associated with fever in early pregnancy. The government website suggests vaccination as the number one line of defense against contracting the flu during pregnancy. Washing hands often, not sharing food and drink and staying away from friends and relatives who may have the flu may decrease your risk of contracting the virus. If you must care for someone suffering from the flu, talk with your obstetrician about antiviral medications safe for use during pregnancy. Antiviral medications can prevent sickness up to 90% of the time, but only when taken soon after contact with the flu virus. When Do I Contact the Doctor? If you have symptoms of the flu, including fever, body aches and pains and fatigue, contact your doctor immediately. 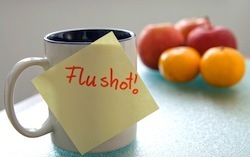 Antiviral medications can prevent serious illness if you indeed have the flu. Symptoms of a medical emergency that may be related to the flu virus include dizziness, high fever, vomiting, confusion and decreased fetal movement. There is no common pregnancy or fetal risk associated with the flu vaccination, according to the U.S. Department of Health and Human Services and backed up by the CDC. There have been reports of increased miscarriage risk; though studies show pregnant women are not at increased risk of miscarrying after having the flu vaccination. High fever associated with the flu, however, has been linked to fetal defects, especially if fever occurs during the first trimester. The flu is a dangerous viral infection that can be prevented with the flu vaccination. The flu vaccine is safe and effective for pregnant women; providing protection for the pregnant woman and the fetus. Protection lasts after birth and continues into infancy with regular breastfeeding.